Your business might have the precise solution to solve a company’s problem. But if your website is hard to find, they will fail to come to you. Is it easy to find your website online on Google? Have you considered making your presence known on search engines? While many companies are still struggling with offline marketing activities, aMarketForce is helping clients by integrating online marketing processes with offline processes thereby creating an end-to-end B2B marketing approach. 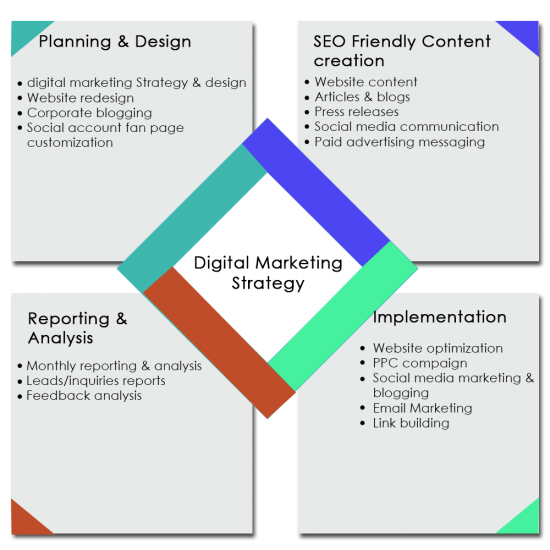 aMarketForce supports planning, design, implementation, reporting and management of multi-channel digital marketing campaigns across varied industries. aMarketForce begins by evaluating a company’s current branding and method of marketing. They then strategize the best way to promote your company to new clients and facilitate growth in its business. aMarketForce will work with you to develop a comprehensive content plan. aMarketForce approves all marketing plans with you (or your employees) before executing on any strategy. The Email Marketing service provides clients with complete follow-through for all email campaign including sales pitches, press releases, event announcements, special offers and newsletter circulation. aMarketForce will target your opt-in prospects and nurture and engage them until they are sales-ready. The search engine optimization service assists clients who want their website to be ranked high on leading Search Engines. Realistic, achievable goals are set for each keywords/phrases based on client requirements supported by good link building strategy. aMarketForce’s talented and experienced PPC campaign management team will create and manage your PPC accounts. They create ad content, set bids, monitor click rate and make necessary changes to ensure you secure high position on the search engine result pages under the paid/sponsored ad links section. The social media marketing service helps clients in creating buzz to attract customers and prospect’s attention. aMarketForce promotes news, blogs, press releases and offers in such a way that it creates a prominent buzz in social network around your fan communities. aMarketForce blogging service supports clients in asserting their company brand and online presence. Blogging is an effective way of collecting prospects and customer’s feedback, steering direct means of communication and increasing SEO effectiveness. The website management service assists clients with the management and upkeep of their Website(s). aMarketForce’s experienced team of web developers serve as a seamless extension of a client’s sales, marketing and communications departments and ensure the client’s website is up-to-date and representative of the business. They also help in creation and management of landing pages for marketing campaigns. Banner advertising helps in behavioural targeting and remarketing through cookie technology which allows banners to be displayed on varied types of websites your prospect uses. aMarketForce manages banner creation, geo-targeting and campaign management. Video marketing adds a whole new element into digital marketing strategy. aMarketForce helps in production, editing and promotions of your marketing videos. Mobile friendly website makes content easy to understand and interpret on hand-held devices. aMarketForce can design, develop and host your mobile website for all major mobile platforms including Apple iphone and Google Android. After implementing your strategy, the job is not over. aMArketForce will continue to monitor and analyze the results of all marketing channels so that they can continue to improve your results and ROI. Contact us to learn more about our internet marketing services. Request a Quote for digital marketing services.